We congratulate all the Award Winners at HOSPA! The 2018 ‘Overall Learners of the Year’ for HOSPA’s Professional Development Programmes in Financial Management and Revenue Management, delivered by arena4finance, were announced yesterday (24th January 2019) at the Jumeirah Carlton Tower Hotel, London. The two outstanding learners were presented with specially engraved glass trophies and complimentary day delegate spaces for HOSPACE2019 by Debra Adams, Head of Professional Development at arena4finance. For Revenue Management: Kris Franklin, Cluster Revenue Manager for Amaris Hospitality, Watford. The programmes, delivered by the Hospitality Professionals Association (HOSPA) in association with arena4finance Ltd, provide the skills and knowledge for those hospitality professionals seeking to excel in their careers in hospitality finance or revenue management. With both introductory and advanced levels available, the modules have been specifically written for the hospitality sector by specialist educators and industry-leaders and reflect the need for learners to be continuing in full-time work whilst studying. The Financial Management programme is studied in three separate stages over 18 months. The Revenue Management programme is offered in three separate levels, each taking five months to complete. 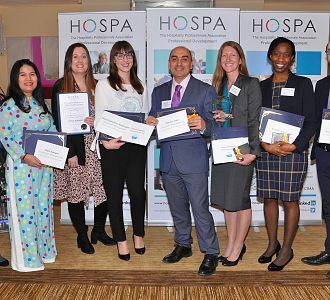 Maria Gutierrez Mondragon and Kris Franklin were both presented with a glass trophy and a complimentary delegate space at HOSPA’s prestigious annual HOSPACE2019 Conference and Exhibition, to be held on 28th November 2019 at the Royal Lancaster London Hotel. The awards were presented by Debra Adams, Head of Professional Development at HOSPA and Harry Murray, President of HOSPA and Chairman of Lucknam Park Hotel & Spa. Maria and Kris were amongst ten learners who each received certificates and prizes for achieving the highest combined course work and examination scores during their studies in Financial Management and Revenue Management with HOSPA on courses completed in February 2018 and August 2018. We were particularly delighted to welcome Yan Zhang who travelled from Dubai to receive her award and Hien Nguyen who visited from Vietnam. Sponsoring the event for the third year in succession was MRK Associates Ltd. MRK Associates is the leading Revenue Management/Pricing recruitment business in the UK with specialist consultants knowledgeable about the market and solely dedicated to finding the right people the right jobs. The deadline date for enrolment for the next intake is 1st March 2019 – for both the Financial Management and Revenue Management programmes. Both courses are available at three levels – Introductory, Operational and Strategic – each at a cost of £820 (ex VAT). For further information, visit: www.hospa.org/education; or email: education@hospa.org.